I'm still reeling from the passing of Tank. I myself am an only child that is why I feel many of the wrestlers are like brothers. Tank and I weren't best friends but we both loved wrestling. He didn't love wrestling because he thought it would bring him fame and fortune, he loved wrestling because it brought him happiness. That is something many can learn from him. I hate when someone passes away and no matter what kind of life they lead people sing their praises. I look at each death with one question "Is the world a better place because they aren't in it?" The world is NOT a better place because of Tank's death. Not a better place for his family, not a better place for our wrestling community and not a better place for me. Tank and I didn't agree on everything but I liked him. Creatively I needed Tank, his size made him a unique commodity for any show. In New Blood Wrestling, Tank wanted to use the old King Kong Bundy 5-count gimmick. So I came up with The Triple 5 Challenge. He could beat any opponent in under 5 minutes with a 5-count and if he didn't his opposition won $5,000. I really like that one but unfortunately it wasn't given the time to mature and if I'm not mistaken, I think he used it again this year in NBW. I also used him for a few weeks in Lethal Attitude Wrestling leading up to the $10,000 Royale Challenge. A 20 man battle royal whose ending was centered around "The One Man Wrecking Crew" Tank. I would like to give my deepest sympathies to Tank's family and closest friends. I know you are missing him in a way many of us can't fathom. 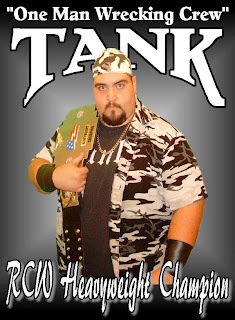 I urge anyone who has wrestling footage of Tank to give it to his wife. So his children can one day enjoy seeing what Tank enjoyed doing. Tim "Tank" Robertson will never be forgotten, I promise because he was as good as gold.